With the EURO 2012 already on the rear mirror, the Portuguese National Team started their preparation for the World Cup 2014 qualifiers with a friendly match against Panama. Cristiano Ronaldo played for roughly 60 minutes, which has proved to be enough time to score a goal and help Portugal beating Panama by 2-0, after the youngster Nélson Oliveira had already scored the opener, earlier on the first half. Portugal hosted a friendly game against Panama this Wednesday night, as part of their preparation for the World Cup 2014 that will be held in Brazil, in about 2 years from now. The opponent wasn't expected to create many difficulties, but the Portuguese side ended struggling unexpectedly, as they wasted chance after chance, becoming unable to set a more favorable scoreline. 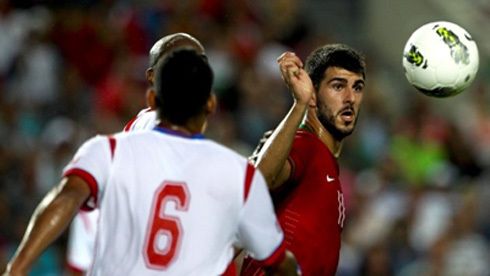 Nélson Oliveira scored his first career goal for the Portuguese National Team, as he gave the lead to Paulo Bento's men with roughly half an hour played in the first half. Cristiano Ronaldo would then score the second goal right after the break, taking advantage of a ball bouncing near Panama's penalty area and striking a strong and precise shot. With most of the top European leagues kicking off this weekend, this Wednesday's international friendly round-up didn't come in the best possible moment. The motivation levels for a game like the one that took place last night were naturally low, which somehow can justify why we didn't see the Portuguese team forcing too much against a weak Panamanian side. Real Madrid and Ronaldo's debut in La Liga 2012/2013 is scheduled for this Sunday (19th of August), in a clash against Valencia CF at the Santiago Bernabéu. When looking at this Wednesday's match, there's something that clearly stands out from any other incident or event related to the game. Portugal still lacks a clinical finisher to play on the center forward role, as both Nélson Oliveira and Hugo Almeida were keen to show after missing so many good goalscoring chances. The 2-0 set as the final score doesn't make true justice to the amount of chances that Portugal had to score, but hopefully with time, Paulo Bento's men will manage to seize better their opportunities, now that Brazil's World Cup 2014 qualification stage is about to start. The first goal of the game occurred when the clocks were ticking the 30th minute and it was the 21-year old, Nélson Oliveira, who decided to shake things at the Algarve stadium. The Portuguese forward received a ball from Porto's defender Miguel Lopes, just before cutting inside and striking the ball to the top right corner of Panama's goal, making it 1-0 for Portugal. Great goal from the player who recently signed for Deportivo de la Coruña, in a loan deal agreed with SL Benfica. The Spanish club has been promoted to La Liga this year, which will probably allow Nélson Oliveira to still face Ronaldo in a couple of fixtures over this season. The 1-0 sticked until half-time, but there was still a player who had something left to say in this game, before going to rest for this weekend's important fixtures. The Portuguese captain, Cristiano Ronaldo, killed a small lob pass from Raúl Meireles on his chest, gave time for the ball to bounce a couple of times in front of him and then fired it into the low left corner to extend the lead to 2-0. One minute before that goal, Panama saw a player being sent off, as Gabriel Gómez decided to physically assault João Moutinho. Ronaldo was subbed by Varela near the 60th minute, in a clear attempt to give some rest to Real Madrid's star player, as the Merengues will face Valencia this Sunday night. The game would then drag to its end with Portugal creating plenty of opportunities to keep scoring, but the lack of a good finisher upfront didn't allow that any of those chances actually ended up on the back of Panama's net. 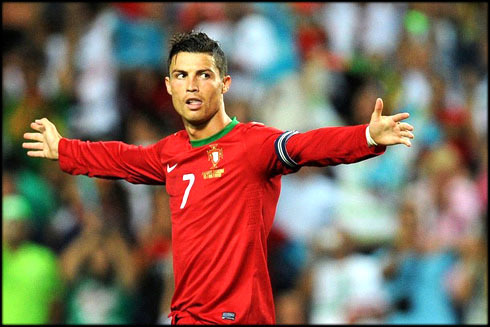 Portugal won the game by 2-0, but will have to improve their game level when the 2014 World Cup qualification games start, right next month. On a side note, we would like to give a quick shout about a relative new website that is dedicated to international football rating and where all visitors are allowed to cast their vote on whoever they rank as the best players, clubs or leagues. As predictable, there's a voting competition open right now precisely about who is the best football player of the World in 2012. Cristiano Ronaldo currently leads the table, with roughly 2.000 more votes than the man coming behind, Barcelona's Lionel Messi. Cristiano Ronaldo and Real Madrid will kickoff their season against Valencia CF, at the Santiago Bernabéu this Sunday night (19th of August, 2012). In the meanwhile, you can watch Real Madrid vs Valencia, Arsenal vs Sunderland, WBA vs Liverpool and Newcastle vs Tottenham from our football live streams section.